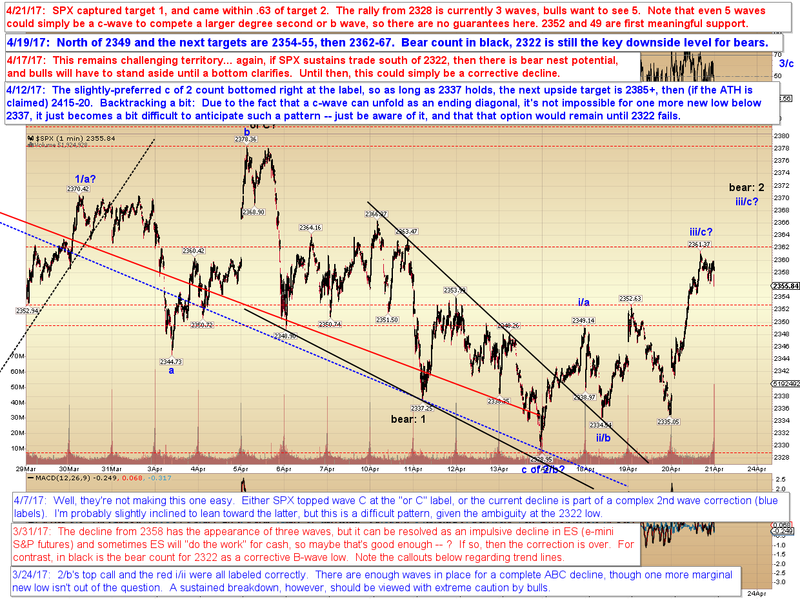 In the prior update, I said that I felt SPX needed at least one more near-term leg up, and published some short-term upside targets for SPX. 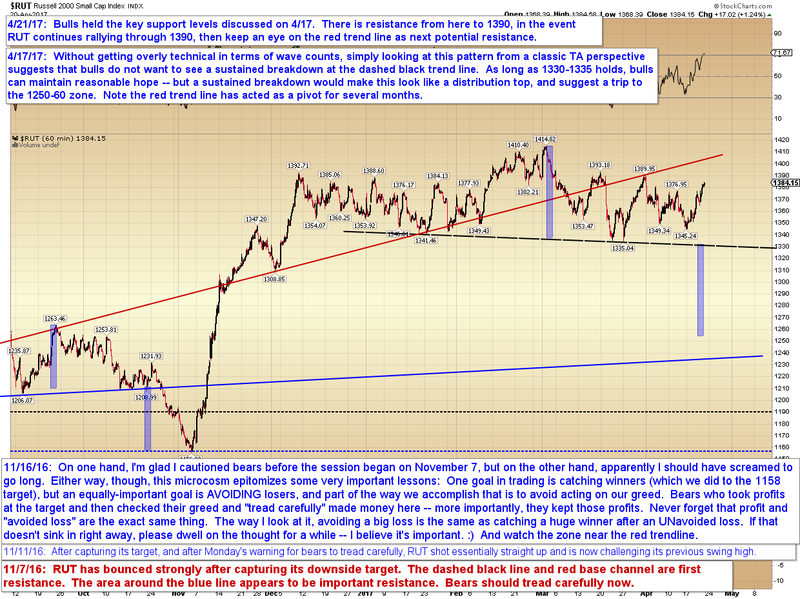 Target 1 was captured yesterday, and SPX came within two-thirds of a point of target 2. The pattern suggests that at least a bit more upside is probably called for, but the way this market has behaved lately (or misbehaved, as the case may be), I'm not holding my breath on anything right now. 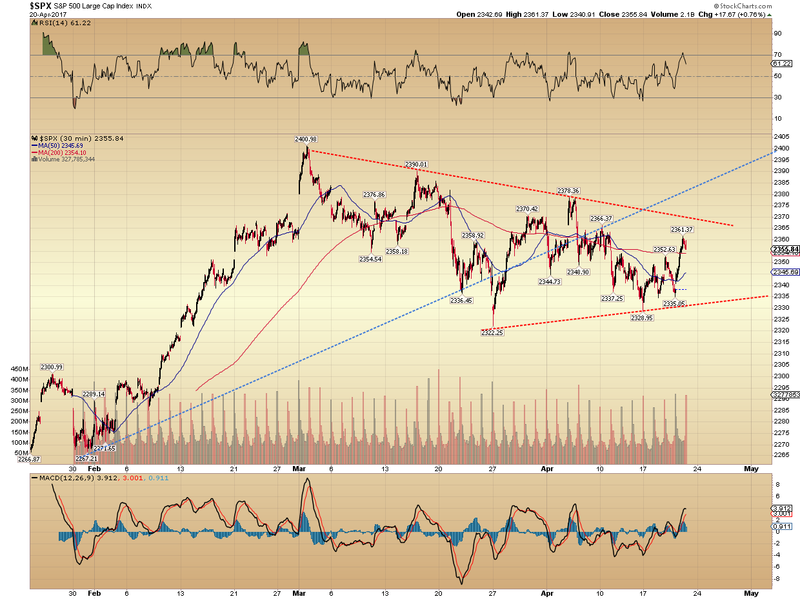 SPX seems to be forming a classic technical triangle. 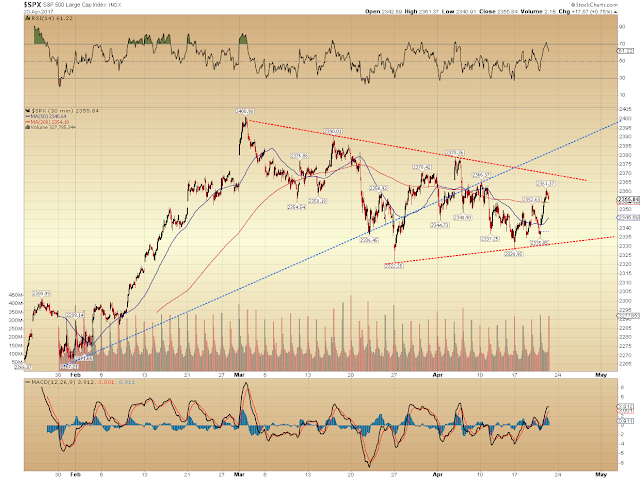 I do not believe this counts well as a true Elliott Wave triangle, but that's not required for it to behave according to classic TA rules, so it's worth paying attention to see how the market responds to the triangle boundaries. In the event SPX rallies thought the upper dashed red line, then keep an eye on the blue line as a potential "stealth" resistance zone. 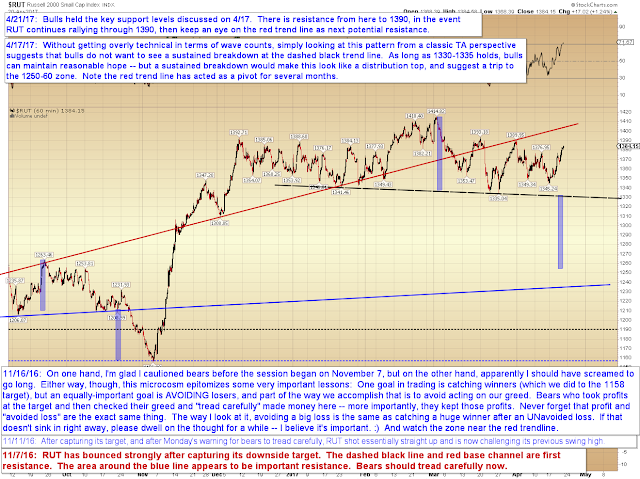 This would roughly correspond to the red line on the RUT chart above. 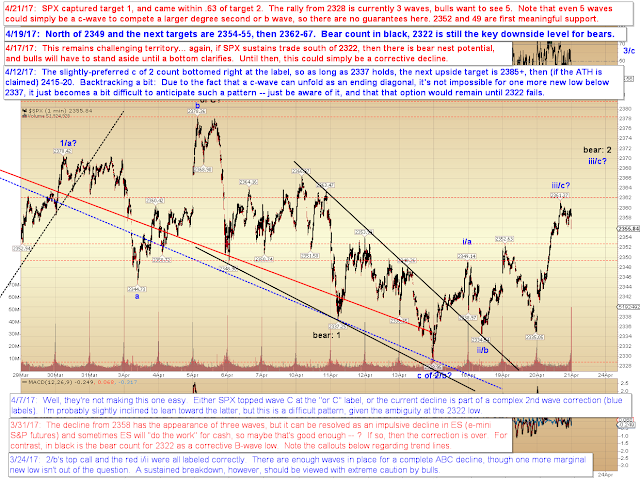 Finally, the bigger picture chart is still unchanged, though I have added the possibility for the current rally to be a larger c wave, as opposed to part of wave 3, which would forestall an immediate bullish resolution, and mean lots more grinding, range-bound movement over the foreseeable future. 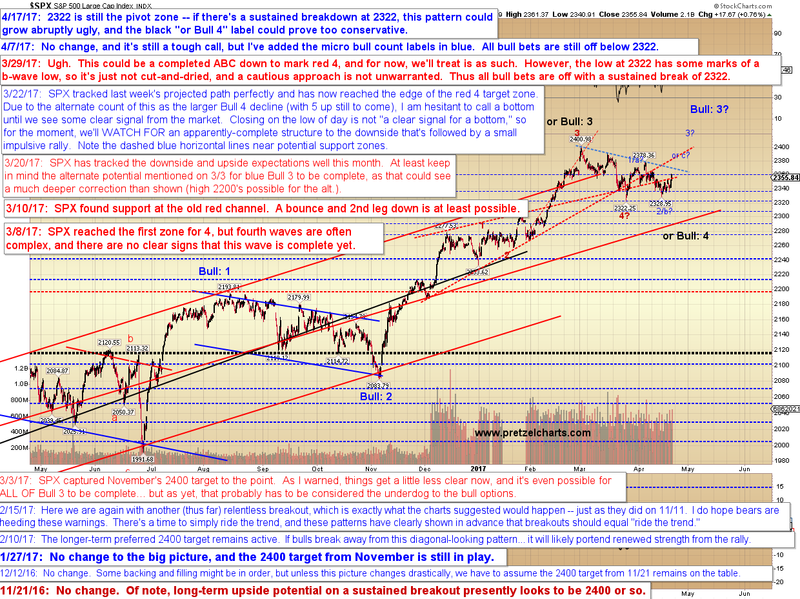 In conclusion, there's still no real change, but I should mention that INDU broke its prior low recently. I looked back through the chart, and INDU did a similar thing in October/November, which ended up not meaning much, so I'm still holding SPX as the more important market for the time being, and still viewing 2322 as the key level -- although, as noted, I have given more consideration to the potential for continued extended sideways chop. Trade safe.